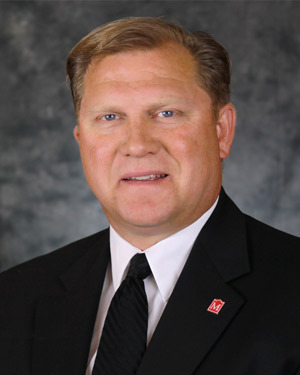 Rick Hedberg became the vice president for advancement at Minot State University in June 2016. In this role, Hedberg is the executive director of the MSU Development Foundation and is responsible for alumni services, annual giving, donor relations, the Board of Regents, marketing, major gifts, social networking and is the lead fundraiser for the university. Hedberg graduated from Parshall High School in 1984. He graduated from Minot State in 1989 with a Bachelor of Science in physical education and earned a master’s degree in educational leadership from the University of North Dakota in 1998. Hedberg spent nine years as a math teacher and head boys basketball coach at Williston High School. He then became an assistant athletic director at UND from 1999 to 2001, prior to being hired as Minot State University’s athletic director in June 2001. As athletic director, Hedberg oversaw the Department of Athletics, including the university’s move from NAIA status to NCAA Division II. In addition to his university duties, Hedberg served as the tournament manager for multiple boys and girls state basketball tournaments for the past 15 years. He was named DAC-10 Athletic Director of the Year in 2002-03. As an MSU student, he was a three-time All-Conference basketball player and also played football for the Beavers. Hedberg is a member of the MSU Hall of Fame, being inducted in 1997. Hedberg and his wife, Andrea (Limke), have two children, Mason and Maddie. Andrea is a 1992 MSU graduate with a bachelor’s degree in elementary education. Hedberg is currently a City of Minot alderman, a board member of the Minot Recreation Commission and the Minot Tournament Committee and a member of the Minot Sertoma Club and Minot Y’s Men’s Club.